Walking the Tokyo streets in the evening we can see many people flooding the enormous pedestrian walkways. It seems people here, although they are famous for their hard working for long hours, yet don’t go home straight-away after work. They like to stroll the streets, the shops, the coffee shops and bars after work. The atmosphere is lively, many of them are just chit-chatting outside bars or at the squares in Shinjuku. Shinjuku area is constantly a bustling, busy town, being a business district in the day and an entertainment district at night. This area initially flourished as a post town for travellers, and gradually developed into a downtown area after the railway station was completed after the Meiji period. Furthermore, many of the lines used by majority of the people living in East Tokyo gather at Shinjuku, evolving the station into a huge terminal. If you are into youth fashion, there is nowhere in the world that people can see such a dynamic, colorful and youthful street fashion culture with fascinating styles changing every day like what is happening in Japan, especially Tokyo, the new raising fashion capital of the world. If you're looking for certain youth fashion styles, Takeshita Street , and the surrounding areas, offer countless different unique styles. You can get band shirts, 'princess' style, goth style, and even costumes. That's what makes this street so unique and popular. You can buy everything from boots to earmuffs, and band t-shirts to badges in lots of styles you might not get at home - and at decent prices, too. It hard to imagine how fashion of Japanese pop culture has developed into such a free style trend that value individual uniqueness in a country of collectivism, focusing on harmony, politeness, hierarchy and tradition. Away from the busy streets, there is another world. Inside a grove of trees through the winding path with 3000 various sizes of stone lanterns along the walk , stands the Kasuga Taisha temple. It is a Shinto shrine, its location was purposefully chosen inside a grove of trees. Shinto is deeply connected with nature and walking through the woods makes it feel you are in another time, even though you are just a few miles away from the busy streets. The 3000 lanterns are symbolic of the 3000 Kasuga shrines spread throughout Japan. Each lantern is donated by a citizen to show thanks and support to the shrine. Writing on each lantern shows which deity the lantern is donated to, or the person’s name that donated the lantern. I discovered Katsushika’s work while looking at souvenirs displayed at the front of a souvenir shop in Mount Fuji 5th station, pictures of a great engulfing wave with Mount Fuji at the back ground on mugs, fans, key holders, and tee shirts. Somehow its uniqueness sticked to mind as something of Japanese painting style, in otherwords it branded itself as something Japanese, it becomes iconic. Such is the power of this picture. 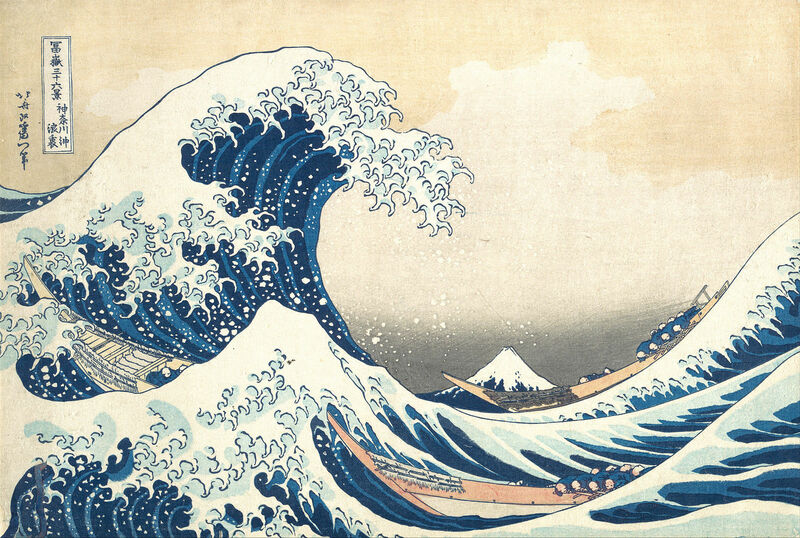 Later, upon browsing the internet I discovered that it is the well known “The Great Wave off Kanagawa” woodblock print work by Katsushika Hokusai, which is part of his Thirty-six Views of Mount Fuji woodblock work. Then I attempted to reach Katsushika-san for an interview, and managed to meet him in one great sunny morning at his residence. “The 1820s was a difficult time for me, I was struck by lightning at 50, suffered a stroke in my 60s that required me to re-adapt to my art work. So I did little work in my sixties; my wife got ill and one of my daughters died. I could cope because that time I was prosperous from my work. But then I was faced by my grandson misfortune who had a lot of debts from gambling habit and I had to pay off all his debts. But in about 1828, I sent my grandson away to the far north of Japan where he couldn't gamble. Then I was free to devote my energy to my creative work. Although, even while drawing the Thirty-six Views, I had scarcely any food. Edo was ravaged by smallpox and flood, and a fire in 1839 destroyed all my studio work. One of the factors for the emergence of my work was the introduction of Prussian blue to the market, imported from the West. As a synthetic pigment, it is more lasting and it lowered the price enough that it became feasible to use the shade in prints for the first time. “ The period of ukiyo-e – the art of the floating world – represented the floating Japan, or the prosperous Japan, which generally depicted the pleasurable side of urban living – courtesans and kabuki actors included. It was the period of Japan’s hedonism world, living life for the moment, partying, dancing, getting drunk, along with the economic boom in Edo (old Tokyo). The art of this floating world, ukiyou-e, raised with the demand, pictures of Kabuki, beautiful women, geisha, courtesans became popular and displayed at homes. Hence you were floating too, your wood block print works were sold well that time. “You painted dragons, creatures of long life, by the dozen. You painted the phoenix, bird of resurrection, and Mount Fuji; immutable, enduring, outlasting all your fellow painters, calligraphers, woodblock-cutters and sellers of coloured books who scrabbled for a living Edo, old Tokyo. “Shunga is sexually explicit art, produced to exactly the same technical perfection as art in other formats by the same people. The Dream of Fisherman’s Wife was based on the story of Princess Tamatori, highly popular in the Edo period. In this story, Tamatori is a modest shell diver who marries Fujiwara no Fuhito of the Fujiwara clan, who is searching for a pearl stolen from his family by Ryūjin, the dragon god of the sea. Vowing to help, Tamatori dives down to Ryūjin's undersea palace of Ryūgū-jō, however then pursued by the god and his army of sea creatures, including octopuses. She cuts open her own breast and places the jewel inside; this allows her to swim faster and escape, but she dies from her wound soon after reaching the surface. 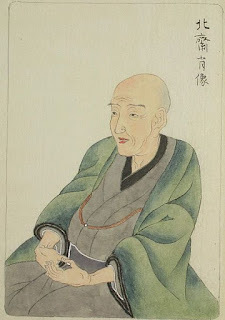 The Tamatori story was a popular subject in ukiyo-e art. The artist Utagawa Kuniyoshi produced works based on it, which often include octopuses among the creatures being evaded by the bare-breasted diver. This is an imaginary interview in memory of Katsushika Hokusai. Tokyo Disneyland, at the Castle. Cinderella’s Castle is the fairy tale castle at the center of the Tokyo Disneyland. It serves as worldwide recognized icon and the flagship attraction for the theme park. Cinderella’s Fairy Tale Hall is located in the castle where various artworks are exhibited that show scenes from her story. In the lobby and corridor, guests will find eight murals showing how Cinderella changed from beloved daughter, to servant girl, and then to Princess. The murals mozaik were designed by Imagineer Dorothea Redmond and crafted and set in place by a team of six artists led by mosaicist Hanns-Joachim Scharff, the 4.6 by 3.0 m ornate panels are shaped in a Gothic arch. The murals took 22 months to complete and contain just over 300,000 pieces of Italian glass and rough smalti (glass made specifically for mosaics traditionally used by Italian craftsmen) in more than 500 colors. Many of the hand-cut tiles are fused with sterling silver and 14-karat (58 percent) gold, and some are as small as the head of a tack. Looking closely at these ornate murals, one will notice that each of Cinderella's wicked stepsisters appears with a little added color - one sister's face is clearly "red with anger", while the other is a little "green with envy" as they watch Cinderella try on the glass slipper. Nara is the capital city of Nara Prefecture located in the Kansai region of Japan. Nara was the capital of Japan from 710 to 794, lending its name to the Nara period. Tōdai-ji or Eastern Great Temple, located in the city of Nara, is a Buddhist temple complex that was once one of the powerful Seven Great Temples. Todai-ji , is a complex of buildings that includes the world's largest wooden structure, and the main hall houses the colossal bronze Buddha statue . Buddhism’s influence grew in the Nara era during the reign of Emperor Shomu and his wife, Empress Komyo who fused Buddhist doctrine and political policy—promoting Buddhism as the protector of the state. In 741, reportedly following the Empress’ wishes, Emperor Shomu ordered temples, monasteries and convents to be built throughout Japan’s 66 provinces under the jurisdiction of the new imperial Todai-ji to be built in the capital of Nara. The vast temple at Todaiji was constructed as a symbol of imperial power, and took over 15 years to complete at great expense. 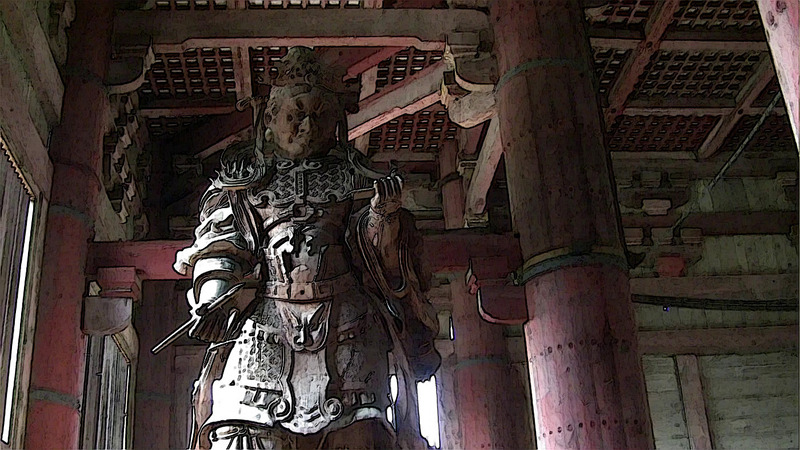 Emperor Shomu’s motives to build Todai-ji temple on such an unprecedented scale seem to have been a mix of the spiritual and the pragmatic: in his bid to unite various Japanese clans under his centralized rule, Emperor Shoumu also promoted spiritual unity. 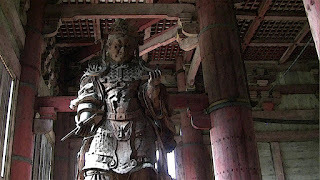 Todai-ji would be the chief temple of the monastery system and be the center of national ritual. Its construction brought together the best craftspeople in Japan with the latest building technology. It was architecture to impress—displaying the power, prestige and piety of the imperial house of Japan. On the centre of this Buddhist temple, you will be able to find the biggest statue of Great Buddha, or Daibutsu, made of bronze. The height of the statue is reaching 15 meters and weighs 500 tons. The Buddha is seated with the palm of his right hand extended forward. This gesture means "fear not" and “conversion of jealousy and envy” into all-accomplishing wisdom. Deer, regarded as messengers of the gods in the Shinto religion, roam the grounds freely. According to legend a mythological god, Takemikazuchi, arrived in Nara on a white deer to guard the newly built capital of Heijokyo. The deer that populate Nara are Sika deer or spotted deer and are also known as bowing deer because they often times bow their heads before being fed. You will find a lot of deer and you can also feed them if you want, but you need to buy the food first.